The film opened in the year 2670 A.D. in North America. A white-haired, wise orangutan, the Great Lawgiver (John Huston) narrated the prologue, reading from a unrolled parchment scroll to an unseen audience on a rural hillside. In the beginning, God created beast and man so that both might live in friendship and share dominion over a world at peace. But in the fullness of time, evil men betrayed God's trust and in disobedience to His holy word, waged bloody wars, not only against their own kind, but against the apes whom they reduced to slavery. Then God in His wrath sent the world a savior, miraculously born of two apes, who descended on Earth from Earth's own future. And man was afraid for both parent apes possessed the power of speech. So both were brutally murdered. [A short review of the events described up to this point were shown with excerpts from Escape from the Planet of the Apes (1971).] But the child ape survived and grew up to set his fellow creatures free from the yoke of human slavery. [More excerpts were shown from Conquest of the Planet of the Apes (1972) regarding ape leader Caesar's revolution against the humans.] Yet in the aftermath of his victory, the surface of the world was ravaged by the vilest war in human history. The great cities of the world were split asunder and were flattened. And out of one such city, our savior led a remnant of those who survived in search of greener pastures where ape and human might forever live in friendship according to divine will. His name was Caesar, and this is his story in those far-off days. The film returned, in flashback, to a "remnant" of the post-nuclear rural society in the year 2003 A.D. (only about twelve years after the events in the previous film, some years after a 'vile' thermonuclear war (off-screen) devastated the major cities but left the countryside untouched), where talking apes (composed of the classes/castes of chimpanzees, orangutans, and gorillas) were dominant. However, they co-existed peacefully together in a communal environment with unenslaved humans, some of whom wore brown homespun clothing and others who had khaki uniforms. Under the credits, the society's hulking gorilla commander, black-leathered General Aldo (Claude Akins) rode on horseback through Ape City, nestled among trees. He was tardy to a classroom of apes (both young and old), where a human Teacher named Abe (Noah Keen) taught reading and writing using the ape's sacred law: "Ape shall never kill ape." The classroom was open-air, with all the students seated on benches, and charcoal-sticks and parchments used for materials. The militaristic gorillas, including Aldo, completely uninterested in learning and almost illiterate, sat in the back. The leader of the society (the "savior" referred to in the prologue), Caesar (Roddy McDowall), was attempting to generate peace and equality between the simians and the remnants of human society, living together in this pastoral setting. He had since become married (to Lisa (Natalie Trundy) from the previous film), and his son Cornelius (Bobby Porter) was in the class and obediently following directions. Close by to the class, an educated orangutan named Virgil (Paul Williams), typical of his scientific-intellectual breeding, was strolling along discussing his advanced ideas about time relativity with two older students. He overheard when Aldo ripped up one of the parchments (written affectionately by Cornelius for the teacher, "Ape shall not kill Abe") in the school, and the teacher reprimanded and yelled "No" at him, like a slave master might have spoken in the old days of servitude. Virgil reminded the teacher that this was an "unspeakable" word: "In all our years of slavery to mankind, the word 'no' was the one word we were electrically conditioned to fear. Caesar has forbidden you its utterance in perpetuity. An ape may say 'no' to a human, but a human may never again say 'no' to an ape." Angered by the teacher, Aldo struck out at him, tore the classroom apart with other gorillas, and caused the Teacher to flee and race away through the village. The gorillas apprehended him at the base of Caesar's treehouse - where Caesar ordered them to stop threatening the human and dragging him away to a corral ("We'll teach the teacher a lesson"). Aldo claimed: "He broke the first law," although Caesar asserted otherwise: "I am the law." He judged the situation by asking Aldo why he tore up the parchment, and received additional support and counsel from his human spokesman/assistant Mr. MacDonald (Austin Stoker), the brother of Governor Breck's assistant in the previous film. Caesar issued his decision to Aldo: "You and your friends will return to the schoolroom and put it back in order." Aldo promised to never return to the classroom, however, instead favoring riding horses: "Now we'll go back to riding horses." After the incident, MacDonald further advised Caesar about Aldo: "Aldo's hatred is not confined to humans," proven when Aldo recklessly came riding by in a posse and almost knocked them down, prompting Caesar to foretell: "I think Aldo may be riding for a fall." Caesar knew he was constrained by the ape axiom: "Ape never kills ape," but wondered what to do to eliminate the "evil" so that "good" would prevail. He thought that if his parents had lived longer, he might have been taught by them what to do, but he was left an orphan. Although Caesar described the society's hierarchy, hoping for equality and trust between the apes and humans: "We are not your masters," MacDonald replied truthfully: "We are not your equals." Caesar was more optimistic about the future of Earth: "Now that apes are at the helm, the Earth will sail safely through space until the end of time." 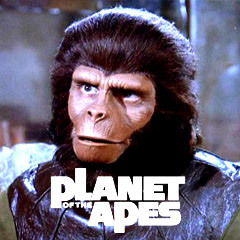 MacDonald informed him that he should view taped archives of his own parents (Cornelius and Zira who "came out of the future" in Escape from the Planet of the Apes (1971)), so that he could have knowledge about Earth's future: "Under the dead city where we once lived, in the archives near the old command post, there are tapes - sealed tapes of Cornelius and Zira being examined by officials of the American government." Caesar was concerned that the underground city was flattened and in nuclear ruins: "The bomb left nothing," but MacDonald was sure that the archives were designed to survive the blast and still existed in the Forbidden City, although the city was radioactive. Lisa was fearful of Caesar's planned journey (to view his parents of the past, and learn more about Earth's future), accompanied by radiation-expert Virgil. Before leaving on their 3-day journey, they spoke to Mandemus (Lew Ayres), keeper of the armory, and requested issuance of weapons "for self-protection in the pursuit of knowledge." He was told they were seeking "the knowledge of Earth's ultimate fate recorded on tapes in the archives of the forbidden city -- which is contaminated but still may be inhabited by humans." They acquired submachine guns, ammunition, a Geiger counter, pistols, and other supplies. They approached the desolate, silent, dead and ruined city, described solemnly by Virgil as "like a storm at sea, but solidified," with twisted, melted and charred wreckage. MacDonald commented about the ghostly remains: "This is the hell my forefathers used to speak about." As their geiger counter ticked, he determined at an underground entrance that they were at 11th Avenue, two blocks west from where the record archives were located. Virgil predicted that at the current radiation levels, they were either 'brave' or 'mad' to be there and had only two hours of time. Meanwhile, in another section of the underground city, at Ape Management's command center, radiation-scarred mutant humans were still living and working drone-like under the leadership of Governor Kolp (Severn Darden), who ascended to the position when the bomb killed the former governor. [These mutants would become the ancestors of the mutants in Beneath the Planet of the Apes (1970).] It was a 'living hell' of radiation. When the trio from Ape City passed a sensor (F-6) on their way to the Archives Section, an alarm beeped in the central command area, noted by one of the survivors Alma (France Nuyen). Kolp's chief subordinate Mendez (Paul Stevens) and other security forces were alerted to the clandestine intrusion, and the group was monitored on video screens. Kolp was dismayed: "That's Caesar, come back to reconquer his kingdom...The black man is the brother of my predecessor's personal assistant. He supervised the archives." 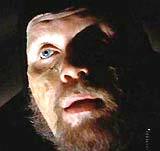 Caesar and his group located the archived tape under "Presidential Commission on Alien Visitors - 1973" (see Escape from the Planet of the Apes (1971)) and viewed the recording. The security forces were ordered to apprehend the strangers, and if need be, only shoot to maim (not kill) - to keep them alive for interrogation. Mendez remarked that shooting would "break twelve years of peace," [The start of peace was in the year 1991 in the last film, making the year of this film 12 years later, or 2003 A.D.] and Kolp replied: "Yes, it has been rather boring, hasn't it?" The recordings informed them about the future of the world and the gorillas' war, and that Earth would be destroyed around 3950 A.D. Virgil theorized that the prediction was only one alternative, and that time was like an endless motorway with an infinite number of lanes or avenues that could be taken to alter the course of history (similar to Dr. Hasslein's description of the complicated nature of time travel in his TV interview in the third film). Caesar remarked firmly: "I know what it is I want to change." The group realized that they were being watched: "Whoever or whatever is down here - Now knows we are too now." As they slipped away to escape, Kolp hysterically issued another order to his armed mutant forces: "Don't let anyone escape alive." They were confronted in one of the labyrinthine corridors and shooting broke out. Caesar grabbed a high-pressure fire waterhose to deter their attack, and they also tossed small hand-grenades at the mutants, before successfully reaching the outside and hastening to get away. Kolp was extremely frustrated and furious at his men for letting the strangers escape. Mendez begged to differ with his boss about how Caesar was only an animal: "He's more than an animal. He can speak. So can they all." He discussed how their intelligence made them humane, and that they might have come in peace - armed only for self-protection. Mendez recommended: "Let them return in peace...to wherever they live," but Kolp disagreed, and organized scout parties to follow them to their Ape City camp "so that we can exterminate them". When the trio approached Ape City, Aldo and his men scuffled with them, asking why they had visited the off-limits Forbidden City. Caesar answered: "I went looking for my past, but I found our future." Aldo threatened with his drawn sword: "Aldo will make the future - with this!" Caesar quipped: "Well then, Aldo may very soon be in the past." Back at Ape City, Lisa found her young son Cornelius "playing war" with a human playmate. She scolded him: "War is not a game" and reminded him that he was forbidden to play with guns. A group of mutants, led by a Captain (Richard Eastham) made it to the outskirts of Ape City, where they spied upon the occupants with binoculars, settled in a valley of orchards and vineyards. They watched as Caesar convened a Council Meeting of apes in an open-air amphitheatre (the different groups sat segregated from each other), and reported upon his recent reconnaissance expedition to the Forbidden City with Virgil and MacDonald as aides. He added that they went in peace to what they thought would be a dead city - but they found human survivors: "Maimed, mutated, hostile, and human." He advised that they must be prepared for the ultimate day when the humans might leave the city and approach Ape City. He stressed that the ape-exclusive Council should now include humans, because of the need for their counsel and help. Aldo angrily led his band of gorillas away, in protest: "We shall not sit in Council with humans." At the same time, Mendez was speaking to Kolp about the necessity of ending the cycle of violence: "Somewhere along the line of history, this bloody chain-reaction has got to stop." When told of the location of Ape City by his scouts, Kolp readied his forces: "We're going after them - now." He also told Alma: "We must either cage the beast or destroy the whole zoo." He led her to their nuclear missile silo, and ominously instructed her regarding the operational Alpha-Omega bomb: "If the impossible should happen, if the apes should defeat us, I will not surrender to an animal. Nor will my soldiers...If retreat does become necessary, I'll send a coded radio signal. 15 minutes later, you're to range the missile at Ape City, and activate it with this button." A convoy of military jeeps with mounted weapons, trucks, motorcycles and armed mutant soldiers departed from the forbidden city, a rigorous three-day march in the heat of the desert. Although Caesar had sworn an oath in the conclusion of the previous film to co-exist peacefully with humans, he described to Lisa why he was now making preparations for war against humans: "Those in the forbidden city are mad - mad enough not to want peace and friendship but enmity and war...These humans are the end product of nuclear radiation. They're mutant and they're mad." Later that night, Cornelius chased after his pet squirrel into some trees, where he overheard General Aldo conspiring with a group of growling gorillas to plot a violent military coup: "Without guns, we have no power. We shall take the guns and we shall keep them. We are the elite. We are the super-race. We have the right to lead. Without us, there would be no army. We need power, guns!..With guns, we will smash the humans. All humans. And then we will smash Caesar." Aldo spotted Cornelius in a tree-top, and hacked with his sword at the slender tree branch where the young chimpanzee was standing, causing him to fall to the ground and suffer severe internal injuries. The next day, MacDonald noticed the hacked tree branch, as Cornelius lay dying while his father kept a non-stop vigil by his bedside. As the mutants approached near to Ape City, led by Governor Kolp wearing ski goggles, they opened fire with a massive blast from a jeep-mounted 105mm gun in the convoy, killing one gorilla and severely wounding another on scout-patrol near a sand dune. The wounded gorilla reported on the humans' attack at a hastily-assembled ape council meeting, prompting Aldo to call for preparations for their imminent arrival. Against Caesar's orders when he wasn't present, the General began barking orders from the leader's chair: "Take the humans out. Lock them all in the corral...Martial law has been declared. Everybody is to stay in their homes." He then ordered his gorillas to loot the armory for weapons: "We want guns. Guns are power! Now we go and get guns." Mandemus protested Aldo's demands and threatened take-over, claiming he was the "keeper of Caesar's conscience" - he refused to turn over guns without Caesar's direct approval, arguing: "weapons may only be issued from this armory under direct orders from Caesar, and not under threats from one of his thicker-headed subordinates for whom war means only personal glory," but his words were of no avail when they broke down the door and raided the supplies. Within sight of Ape City, Kolp ordered the total destruction of Ape City after their assault at sunrise: "I want it to look like that city we came from." Virgil notified distraught Caesar of Aldo's take-over of power, seizure of weapons, and corraling of humans. Caesar remained with his son, and heard from him that his injuries were not accidental: "They hurt me. They want to hurt you." Cornelius passed away (with a smile on his face) when his father told him something he had already told him earlier: "One day, you are going to be as tall as a king." Devastated by the loss, Caesar grieved and sobbed at the bedside. He eventually left to confront General Aldo, who rationalized his militaristic actions as "security." Caesar ordered Aldo to immediately release the humans, but they were interrupted by the start of the mutant's bombardment and assault (Aldo grunted: "Aldo was right. War has come"). The pitched battle was engaged, with the apes defending their city from behind a perimeter-barricade. The assault was initially successful (Kolp: "Nothing left alive! "), and Caesar was forced to call for his apes to fall back to the village. When Kolp drove into the village and surveyed the dead ape bodies and destroyed homes, he came upon a slowly-reviving Caesar, and insanely ranted about how the apes would again be enslaved by humans: "Your people weakened our city by rebelling against your human masters. But we who survive will create a new race, and you and yours will be brought low, and you shall learn again what it is to have a master." Kolp taunted him, called him a "clever ape," and brandished his pistol at Caesar: "And now, Ape City is about to lose its king." From her tree-home, Lisa witnessed her husband's humiliation, and shouted out: "No, Kolp, no!" When Kolp turned away and faced toward her voice, Virgil threw a grenade and the fallen apes on the ground revived (they were only feigning death) and counter-attacked as Caesar ordered: "Now! Fight like apes!" The apes used nets dropped from above and other tactics to capture and subdue most of the mutant troops. They were under Caesar's orders to "take them captive...Don't kill them. Take them prisoner." The few mutants who were able to retreat in a yellow school bus, jeep, and on motorcycle faced Aldo and his gorilla cavalry beyond the barricade, who yelled: "No prisoners!" The bloodthirsty gorillas circled the school bus and then mercilessly killed everyone, including Kolp, with brutal machine-gun fire, and afterwards cheered their leader Aldo. After the victory over the mutant humans, Aldo claimed the city was his ("Aldo says what we do now"). He demanded to kill the humans in the corral ("Kill them all"), but Caesar wanted to set them free, and shielded them from harm with his own body. He also ordered the weapons to be returned to the armory, calling for no more killing. Aldo threatened: "Move Caesar, or we shall kill you." During the stand-off, Virgil reminded the entire community of their most sacred law: "Ape has never killed ape, let alone an ape child." It was revealed that Aldo had malevolently caused Cornelius' death: "The branch did not break. It was cut with a sword." (In the corral, as MacDonald heard the apes repeatedly chanting "Ape has killed ape," he observed: "You might say they just joined the human race.") Caesar was in disbelief ("You murdered my son"), but infuriated - and stalked the ostracized and shamed Aldo, who climbed into a tall tree, lost his balance and fell to his death when he slashed at Caesar with his sword. Afterwards, Caesar asked Virgil: "Should one murder be avenged by another?" Virgil replied: "Only the future can tell, so let us start building it." The humans were set free, but they stood outside the gate staring at Caesar, with MacDonald as their spokesperson, demanding real and total freedom rather than second-class citizenry: "What have we to be grateful for? If you mean to set us free, then free us completely....We are not your children, Caesar. We have a destiny, too, as equals, respecting each other, living together, with love." Caesar scoffed: "Love? The human way is violence and death." Virgil reminded Caesar that violence-prone Aldo wasn't human, while Lisa reassured her husband that he was "a good and wise king." In Ape City, Caesar took MacDonald's words to heart. He vowed: "We'll rebuild what's ruined and begin again." He asked MacDonald if they could possibly refashion the future to their wishes, to have apes and humans peacefully co-exist with equal rights in a new society. The guns were returned and replaced in the armory, where Mandemus requested that his home for 27 years be destroyed to prevent a repeat of what had transpired. Virgil wisely added: "The greatest danger of all is that danger never ends." Caesar advised Mandemus to "be patient and wait." Caesar's words morphed into the words of the Great Lawgiver from the film's prologue, with the camera panning to reveal his audience of young humans and apes: "We still wait, my children. But as I look at apes and humans, living in friendship, harmony, and at peace, now some 600 years after Caesar's death, at least we wait with hope for the future." One little girl asked: "Lawgiver, who knows about the future?" He replied: "Perhaps only the dead." The last ambiguous image was a tracking zoom shot to a nearby statue of Caesar, and a closeup of his left eye shedding a tear. The fifth film in the original five-film series, and generally considered the weakest and least popular. With a production budget of $1.8 million (the lowest in the series), and box-office gross receipts of $9 million (domestic).